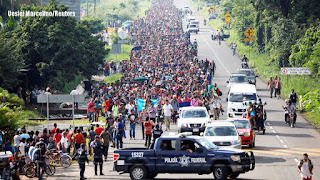 DAILYKENN.com --First, some waved Honduran flags. Then, others burned the American flag. And now different members of the alien horde marching on the USA border are suing our president and our nation. Imagine Joseph Stalin suing Poland for resisting its invasion at the onset of WW2. Who is putting them up to this? Who is funding it? Who is giving them legal counsel? If Donald Trump is a racist, why would they want to live under his administration? If America was founded and remains controlled by a racist white patriarchy, why would they want to live among us? Are they acknowledging white-majority nations are superior to their home brown-majority nations? Are the invaders white supremacists? Isn't it uncanny how confident they are? And certainly no reason for then not to be. Most of the huge US Immigration authority is designed to process aliens in. Not keep them out. It operates to serve immigrants. Not concerned Americans. Truth told, if there ceased to be the unending chance of drugs, official US activity at US ports of entry would begin a large scale even final decline. Please consider the protracted search criteria employed on US airline passengers at US airports. It is largely unprecedented. And its depth greatly inconsistent with simple security concerns. The elaborate depth and relentlessness involved in such close quarter search formats is almost entirely exclusive to drug expeditions and very little else. Such as forays inside wallets, backs of photographs and other small even tiny areas where weapons and explosive presence has always proved impossible. Frankly, security inspections are rather controlled and restricted. While the common drug search in contrast, operates often without limit. So unless the Honduran mass movement is strongly suspected of drugs, it's most likely they will get in. Not kept out.